Bible translations into Welsh have existed since at least the 15th century, but the most widely used translation of the Bible into Welsh for several centuries was the 1588 translation by William Morgan, Y Beibl cyssegr-lan sef Yr Hen Destament, a'r Newydd as revised in 1620. The Beibl Cymraeg Newydd ("new Welsh bible") was published in 1988 and revised in 2004. Beibl.net is a new translation in colloquial Welsh which was recently completed. Several 19th century sources quote the story that a translation from the Latin Vulgate was in existence in 1470. This story comes from Bishop Richard Davies who claimed to have seen, as a boy, such a translation in a manuscript in the house (named Celydd Ifan) of an uncle. However, Professor Glanmor Williams dismisses the theory that the whole Bible had been translated into Welsh before William Morgan's Bible appeared in 1588. Following the English Reformation, translations were made directly from the Greek versions. In 1551 Salesbury was responsible for the publication of the first substantial portion of the Scriptures to appear in Welsh, entitled Kynniver llith a ban, which was a translation of the Gospels and Epistles appointed to be read in Church on Sundays and Holy-days. In 1563 a law was passed in the name of Queen Elizabeth I, which instructed the Anglican Bishops in Wales and Hereford to arrange for the Bible and the Book of Common Prayer to be translated into Welsh. The work was accomplished by Richard Davies, Bishop of St David's, his cantor Thomas Huet, and William Salesbury. They worked at the Bishop's palace in Carmarthen, where they translated the New Testament from Greek. The First Epistle to Timothy, Hebrews, James, and 1 and 2 Peter were translated by Richard Davies, and Revelation was translated by Thomas Huet. However most of the work was by William Salesbury. William Salesbury translated the Book of Common Prayer from English, which was published, together with his translation of the Psalms from Hebrew, on 6 May 1567. The New Testament was issued on 7 October 1567. They were both published by Humphrey Toy and printed in London by Henry Denham. In 1850 Robert Griffith, a bookseller in Caernarfon, published a new edition of Salesbury's New Testament which was printed in Caernarfon by James Rees and probably edited by the clergyman, Isaac Jones (1804-50). This was faithful to the original but the orthography was updated, and it was printed in a modern font to make it easier to read. These have now been digitised by the Bible Society and are included in their app called "ap Beibl". Memorial in St John's College, Cambridge to the Welsh Bible translators William Morgan and Edmund Prys; with quotations from Ecclesiasticus 44 and Psalm 121. Salesbury's New Testament was followed by William Morgan's translation of the whole Bible in 1588, Y Beibl cyssegr-lan sef Yr Hen Destament, a'r Newydd. Morgan soon began work on a revision of his 1588 Bible, which contained a number of printing errors (or on a new translation). William Morgan revised Salesbury's New Testament and Psalms, and completed the rest of the books of the Old Testament and the Apocrypha. After Morgan's death, Bishop Richard Parry and Dr John Davies continued the work with the aims of polishing the literary language, replacing forms considered too colloquial, and bringing the text into greater conformity with the King James Version of the English Bible of 1611. The revised version of the Bible was published in 1620. This edition is still known as William Morgan's translation, and it is this rather than the previous edition which was the standard Welsh Bible until the late 20th century, and continues to be used to this day. It occupies a similar place in the Welsh language to that of the venerated King James Version in English. The early Bible editions were large volumes intended for use in churches; in 1630 a smaller edition called "Y Beibl Bach" ("the little bible"), intended for use in the home, was published, thus bringing scripture in Welsh into the hands of the laity. 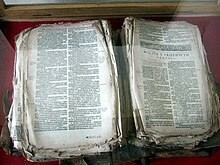 An original copy of the Welsh Bible is displayed in St Asaph Cathedral, in St Asaph, North Wales. It was used at the investiture of Prince Charles as Prince of Wales in 1969. The translation of the Bible into Welsh was important to the survival of the Welsh language. It had the effect, along with the Welsh translation of the Book of Common Prayer, of conferring status on Welsh as a liturgical language and a vehicle for worship. This in turn contributed to the language's continued use as a means of everyday communication down to the present day, despite the pressure of English. The edition of the William Morgan Bible used today uses the modern orthography (spelling), updated by Professor Henry Lewis (1889-1968). He completed the New Testament in 1936. He then completed the main Bible in 1955, and it was printed by the British and Foreign Bible Society as "Y Beibl". He completed the Apocrypha in 1959, and this was printed by the Society for Promoting Christian Knowledge as "Yr Apocrypha". These have now been digitised by the Bible Society and are included in their app called "ap Beibl". The most recent editions of the William Morgan Bible (1955 edition) were printed by the Trinitarian Bible Society using the 1955 orthography. Salmau Cân (Metrical Psalms) is a translation of the 150 Psalms into free Welsh verse, suitable for congregational singing. It was the work of Edmund Prys (also spelt Edmwnd Prys) (1544-1623), a poet, rector of Ffestiniog and Archdeacon of Merioneth. They were printed in London and first published with the 1621 Book of Common Prayer. Edmund Prys is mentioned by William Morgan as one of three who helped him in the preparation of his translation of his 1588 Bible. Many of the Psalms are still sung in Welsh places of worship. Thomas Briscoe (1813-1895) translated Isaiah, Job, Psalms and Proverbs from Hebrew in Welsh, which were published between 1853 and 1855. His translation of the New Testament was published in 1894. William Edwards (1848-1929), a Baptist College Principal, revised the William Morgan New Testament by reference to the Greek, which he called Cyfieithiad Newydd ("New Version"). It was published in four volumes in 1894, 1898, 1913 and 1915. A project was started by the Theological Branch of the Guild of Graduates (alumni) of the University of Wales, to translate the Bible into modern Welsh. A team of 53 scholars worked on New Testament book by book, and the results were printed in portions between 1921 and 1948. Additionally Amos and Hosea from the Old Testament were published in 1924. It was never published as a whole. The Welsh author and one time Calvinist Methodist minister, Rev Islwyn Ffowc Elis translated the Gospel of Matthew into modern Welsh, which was published in Caernarfon in 1961. It was called Efengyl Mathew and subtitled Trosiad i gymraeg diweddar. In 1969 the Bible Society produced a Gospel of John in Popular Welsh called Y Ffordd. This was followed by the translation of all 4 Gospels in 1971 as Y Ffordd Newydd. The publications included illustrations by Annie Vallatton and it was done in the style of the English Good News Bible. A new translation, Y Beibl Cymraeg Newydd (BCN), was published in 1988 (including the revised New Testament published in 1975 and the Psalms in 1979) and has largely replaced the William Morgan translation, although its publishers stated that it was not intended to supplant Morgan's translation, but merely as an alternative. It also included the Apocrypha. A revision, Y Beibl Cymraeg Newydd Diwygiedig (BCND) (the Revised New Welsh Bible), was released in March 2004, and the Apocrypha (called Yr Apocryffa) was printed in 2008. Professor John Tudno Williams and Professor S.I. Enoch were members of the New Testament Panel. The revision received attention after it was revealed that the new Bibles were printed and typeset in Korea and Scotland, respectively. This led Welsh Assembly member Nick Bourne to wonder why production wasn't carried out in Wales. In 2005 an audio version of the BCND was produced by the Bible Society called "Y Llais". The parts of Jesus Christ and Paul are played by two well-known professional actors - Richard Elfyn and Rhys Parry Jones - and other prominent Welsh voices also feature, including Lisabeth Miles. Salmau Cân Newydd (New Metrical Psalms) is a new metrical version of the Psalms, based on the 2004 Welsh translation of the Bible, but also having regard to the original Hebrew, by Gwynn ap Gwilym (1950-2016), a Anglican priest in the Church in Wales. A variety of metres are used and appropriate tunes suggested. It was published by Gwasg Gomer (Gomer Press) in 2008. Both the William Morgan and BCN versions are in literary Welsh; a translation in a more colloquial register was made by Arfon Jones as part of the beibl.net project. The complete Bible was printed in 2015 and is available from the Bible Society. It is also hosted in the Digital Bible Library. It is available on-line at bibles.org and for the YouVersion app. Testament Newydd William Salesbury, 1567 Canys velly y carodd Duw y byt, yny rhoddes ef ei vnig-enit vap, y'n y vydei i bop vn a greda ynthaw, na choller, amyn caffael bywyt tragyvythawl. Beibl William Morgan, 1588 Canys felly y cârodd Duw y bŷd, fel y rhoddodd efe ei uni-genedic fab, fel na choller nêb a'r y fydd yn crêdu ynddo ef, eithr caffael o honaw ef fywyd tragywyddol. beibl.net by Arfon Jones, 2008 Ydy, mae Duw wedi caru’r byd cymaint nes iddo roi ei unig Fab, er mwyn i bwy bynnag sy'n credu ynddo beidio mynd i ddistryw ond cael bywyd tragwyddol. Some Welsh Bible translations are also available in audio: In 2005 the Revised New Welsh Bible (BCND) was recorded by the Bible Society as Y Llais. The parts of Jesus and Paul are played by two well-known professional actors Richard Elfyn and Rhys Parry Jones. Originally it sold as an 18 CD box set but the audio is now available for free on the "ap Beibl" Welsh Bible app. The William Morgan Bible was recorded by Cymdeithas Darllen Pethau Da (CDPD). The New Testament was produced on CD in 2008, and later the rest of the Bible. The speaker is Gerallt Jones of Dolgellau, Gwynedd, north Wales. The beibl.net translation is currently being recorded as well. The text of Y Beibl Cymraeg Newydd is available as a module for the e-Sword program. Many of these translations are available for free to download, on the app called "ap Beibl" which is free to download on Android and iPhone. The app was first launched in August 2015 and new content is added each year as they are digitised. Y Llais, audio for the BCND was added in August 2018. ^ The Bible of Every Land: A History of the Sacred Scriptures. 1861. p. 154. A Welsh version of the Bible was preserved in MS. at Celydd Ifan, near Bridgend in Glamorgan: it appears to have been executed from the Latin Vulgate, by an ancestor of the family residing in that place, about the year 1470. ^ In modern orthography, this might be "Cynifer llith a ban o'r ysgrythur lân ag a ddarllenir [yn] yr Eglwys pryd cymun y suliau a'r gwyliau trwy'r flwyddyn: o gymreigiad W.S.". Welsh language Bible of 1588 View digital images of the entire Bible online (digital images of the actual book printed in 1588). Cymdeithas Darllen Pethau Da - Listen to the original William Morgan Bible in MP3 format.